Isaac Penny during The Bus Assassination. Isaac Penny is a character in the HD Universe who appears as a minor character in Grand Theft Auto V. His voice actor is not credited. Isaac Penny is a venture capitalist and CEO of the Vapid Motor Company having taken a controlling stake in the company. Penny planned to lay off a number of the employees to force the stock price down in order to purchase more stock. Lester Crest discovers his plans and discovers he regularly uses the Los Santos Transit bus system to get to work. 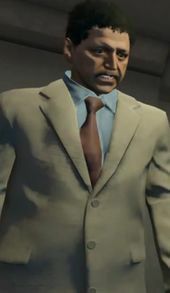 Franklin Clinton, working on orders from Lester, drives a bus until he finds Penny on San Andreas Ave. Franklin tells him the fare will be $1.50, which Penny calls a 'fare hike' before exiting the bus and stealing a bicycle. Penny begins cycling away but is killed by Franklin. After his death the stock price for Vapid Motor Company drops significantly as the company is without a CEO and its majority shareholder. This page was last modified on 17 December 2013, at 01:00.